(Reuters) – In a historic shift, the Boy Scouts of America will let girls enroll in Cub Scouts starting next year and allow them to eventually earn the highest rank of Eagle Scout, the organization said on Wednesday. The unanimous decision by the 100-year-old group’s board of directors came after years of requests from families and girls, it said, though the announcement prompted a largely negative reaction on social media. “We believe it is critical to evolve how our programs meet the needs of families interested in positive and lifelong experiences for their children,” Boy Scouts Chief Executive Michael Surbaugh said in a statement. The Boy Scouts of America (BSA) has lost about a third of its members since 2000, which now stands at 2.3 million. BSA insisted that allowing girls was in response to the needs of families, not related to declining membership. Starting in 2018, the Boy Scouts will allow girls to join the 7- to 10-year-old Cub Scouts. Small, community-level “dens” will be single-gender. Larger “packs,” which are comprised of dens, will decide whether to include dens of each gender or not, the BSA said. In a program to be announced next year and projected to start in 2019, girls will follow the same curriculum as the Boy Scouts, which are for ages 11-17. After the announcement, the Girl Scouts issued a statement that did not mention the Boy Scouts or its move to include girls. “Girl Scouts remains committed to and believes strongly in the importance of the all-girl, girl-led and girl-friendly environment that Girl Scouts provides, which creates a necessary safe space for girls to learn and thrive,” the organization said. In August, a top Girl Scout official accused the Boy Scouts of running a “covert campaign” to recruit girls to increase its declining membership, the Washington Post reported. The program for girls older than Cub Scouts projected to begin in 2019 will allow them to earn the Eagle Scout rank, the highest achievement in the organization. On social media, hundreds of people were critical of the news, with many posts echoing the sentiments of Donald Trump Jr., the president’s son. “Strange, I thought that’s what the Girl Scouts was for?? ?” he said on Twitter. Sing Oldham, spokesman for the Southern Baptist Convention, said the announcement continued a “reinvention” of the Boy Scouts his group does not support, including the decision in 2013 to allow openly gay members. In January, the Boy Scouts also opted to allow transgender boys to join. KUALA LUMPUR: A teenager who suffered 25% burns on the body from the alleged negligence of a teacher when he took part in a co-curricular activity as a boy scout has settled his civil suit. Student Haydn Shawe Zanshin Shan Chinson St James, now 19, and his father settled the claim against the Government, the Education Minister and four others. After the proceedings in chambers Tuesday, the plaintiffs’ lead counsel Alex De Silva said the suit was settled amicably. “The Judicial Commissioner (Mohd Firuz Jaffril) recorded a consent judgment. We can’t reveal the terms of settlement,” he told reporters here. Senior Federal Counsel Zureen Elina Mohd Dom confirmed the settlement. Haydn’s father Kenneth Yoong Ken Chinson St James told The Star his son was now studying at a university in Sydney. “I couldn’t be prouder of Haydn. He is a very tough boy. He went through excruciating pain for a long period of time. But he bounced back,” he said. He said they filed the action so that schools and the Government would realise they have to expend more effort, money and time to make schools safe for children. “They must also train their personnel better, to ensure no negligent act or omission is committed against our children, whom we place in their care,” he added. In the amended statement of claim dated April 13, 2015, the plaintiffs said a teacher poured or threw a flammable fluid believed to be turpentine directly onto a fire, which students in Haydn’s group had started for cooking at about 3.30pm on April 4, 2012, during the scouts activity on the premises of the national school in Desa Sri Hartamas here. They said some of the fluid splashed onto Hadyn’s body and clothes. Haydn, then 14, was diagnosed with second and third degree burns on about 25% of his body. He was hospitalised for 27 days and underwent several skin graft procedures. Haydn would frequently cry out from the pain, distress and severe itchiness. Among others, the St James’ sued the parties for wrongful act, negligence and breach of duty of care. They named the teacher, Government, Education Minister, Education Ministry director-general, its Federal Territory department director and the school principal as defendants. They claimed the teacher had failed to take precaution and care in the handling of flammable fluids. They sought RM22,243 in special damages and an unspecified sum in general and aggravated damages. In the statement of defence, the defendants denied any wrongful act, negligence or breach of duty of care, saying the teacher, who was a school scouts advisor, took reasonable steps during the activity that day. The teacher claimed Haydn had committed contributory negligence for his injuries. THE just concluded third National Level Scouting Skills Competition organised by the Shiang Yang Scout Troup Bercham drew huge participation from all over the country. 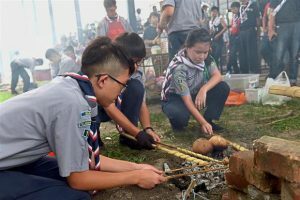 Held in conjunction with its first International Level Scouting Skills Competition at the Bercham Recreation Park in Ipoh, the 1,647 scouts and girl guides who took part included those from Japan, Singapore, Taiwan and Brunei. Emerging as overall champion was the SM Hin Hua contingent from Klang with the Osaka Boy Scout Council contingent getting the Best Supporting Award. The Best Discipline Award went to the SMJK Hua Lian contingent from Taiping while the Best Commander Award was given to SMK Bukit Mewah from Seremban. 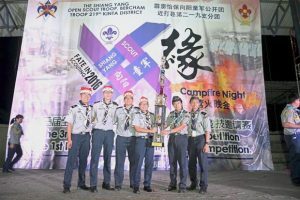 Shiang Yang Scout Troop honorary secretary Voon Yeow Hong said the participants took part in 11 competitions in total. The champions in each category were SMJK Yuk Choy Ipoh (cooking); Penang Free School (dance); Kelana A Georgetown (short drama); and SMK Convent Greenlane Georgetown (costume design). Meanwhile, SM Hin Hua Klang emerged tops in the backwoods cooking competition, pioneering project model competition, semophore and Morse code competition, knot and lashing competition, and commando obstacle (female category) competition. SMK Bukit Mewah Seremban won in the foot drills, commando obstacle (male category) and first aid competitions. SCOUTING is more than an extra-curricular activity to some. For those like 19-year-old Ooi Ken Lin, it has taught him some of life’s most useful lessons. “Scouting has changed my way of life. King scout: (From left) Mohamad Arif Abdul Razak, T.Dineesh and Ooi admiring their king scout merit badge at the award ceremony. “It was by being a scout that I learnt how to cook,” said the former SMK St George, Taiping student who joined the movement when he was in Form One. Ooi was among 275 scouts from all over Perak who received their King Scout badges, which is the highest award for Senior Scouts, from the Raja Muda of Perak Raja Dr Nazrin Shah. There are 27 badges to collect before one can qualify as a King Scout. Each badge is earned by passing particular tests. State Education director Datuk Mohd Rauhi Mohd Isa was perhaps the proudest during the recent ceremony in Ipoh as he was bestowed the “Bintang Semangat Rimba Kelas Kedua — Perak” by the Regent for his contribution to the scouting movement. The award is the fourth highest award by the Scout Association of Malaysia. Earlier in his welcoming speech, Perak Scout Council chairman Datuk Ishak Mohamed said the King Scout recipients must continue to be active despite having received the highest achievement in the movement. “Remember, once a scout, always a scout,” he said, adding that there were currently 332 scout groups with 13,912 members throughout the state. BUKIT MERTAJAM: The state government will help the Penang Scouts Association find a campsite to replace its Coronation Camp in Waterfall Road that was closed in 2006. 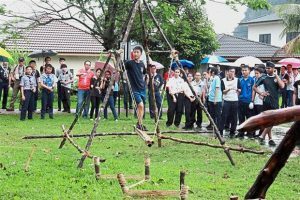 State Health, Welfare, Caring Society and Environment Committee chairman Phee Boon Poh said the camp, which used to be the main venue for scouting activities, including annual jamborees, was acquired to make way for the Penang Botanical Gardens’ expansion project. “The state is fully aware of the need for a proper campsite for the scouts to conduct their activities. “We want our youths to obtain the necessary exposure through the scouts movement, which provides vital survival skills in training, first-aid as well as good values and discipline,” he said after opening the Penang Scouts Environ-ment Protection programme at the MPSP branch office in Jalan Betek here yesterday. Phee said a suitable site was needed for the campsite so that the scouts could have the natural surroundings to conduct outdoor activities. 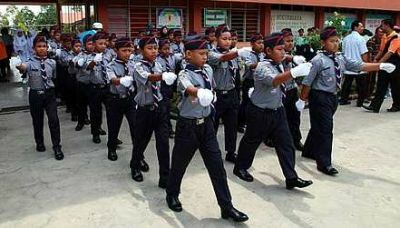 Penang state scouts commissioner Zulkafli Kamaruddin said Penang was the only state that did not have a scouts’ campsite. 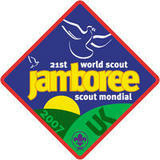 “We have not organised a jamboree in more than 10 years because we do not have a proper venue. We hope the state government will seriously help us find an alternative campsite,” he said. Apart from a blood donation campaign and an environment talk, the programme also included mudball-making and enzyme-making activities. This entry was posted in Uncategorized on August 22, 2011 by admin. 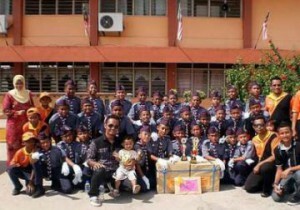 A day under the hot sun did not deter the boy scouts from SK Bandar Tenggara 1 to win the state-level uniformed body marching competition held in Kulaijaya, Johor, recently. Patrol leader Ahmad Ridhwan Jamil, 12 attributed team spirit as the main factor for his troop’s success in winning the coveted challenge trophy. “To be successful, it is important to listen to our coach and the teachers as they know better,” he said. Ahmad Ridhwan added that this was the first time he had led his patrol to victory. Best of the rest: The winners from Sekolah Kebangsaan Bandar Tenggara 1 who represented the district of Kulaijaya taking a group photo. “I am a scout and have always wanted to be a patrol leader in a marching competition,” he said. SK Bandar Tenggara 1 scoutmaster and trainer Md Salam Rohani said his troops practised daily for half an hour since January to prepare for the competition. “They are very committed and this is the reason why we won the state-level competition nine years in a row,” he said. Md Salam added that SK Bandar Tenggara 1 had also won the national-level marching competition four times. “I think this time, we stand a good chance gaining the top position at the next national-level competition,” he said. Showing discipline: The third runner up for the commpetition was from Sekolah Kebangsaan Seri Kemanjuan who represented the district of Batu Pahat. The scoutmaster said his troop has a strength of 31 patrol boys. With their victory, SK Bandar Tenggara 1 will represent Johor at the next national-level marching event. Second place in the marching competition went to SK Bandar T6 from Kluang while the third runner-up title was clinched by SK Seri Kemanjuan in Batu Pahat. At the closing ceremony Kulai district education officer Ali Bahrom said a total of 10 schools from the state had participated in the competition. “Congratulations to all the winners and to those who did not win, please learn from your mistakes and never give up,” he advised. This entry was posted in Events on April 30, 2011 by admin. TANGKAK is a little town in Johor with an excellent view of Mount Ophir or Gunung Ledang in its backdrop. I was told that back in the good old days – it was a norm for the Boy Scouts from Muar to cycle there and summit its 1,276-metre peak as part of their King Scout assessment programme. To get a bigger picture, I took a trip to Muar recently with Michelle, my wife and cycled from the town to Tangkak. Arrival at destination: The writer and his wife in Tangkak, Johor. We rode our Dahon folding bicycles for a distance of 36.5km along a scenic route that took us to Sungai Mati, Parit Ponorogo and Batu 10 before arriving at the town centre. Before we set off from Muar, we had breakfast at a coffeeshop and cycled across the bridge that links this town to the outside world. Moving on an average speed of 18km/h, there’s plenty to see and if you love kupang (mussels) and lokan (giant freshwater clams), there are stalls that are dotted along both sides of the road. A bag of kupang costs RM5 (roughly about 1kg) and these are as fresh as they can get. And if you are a durian enthusiasts, there are plenty to go around. We found at least 10 stalls all along the way from Muar to Tangkak. 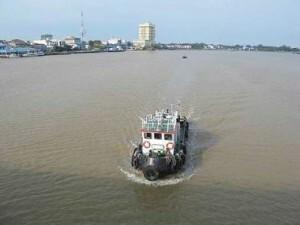 Maritime activity: A tugboat makes its way along the Muar river. As for the level of difficulty in cycling along this route, you have to be physically fit to tackle 15km of undulating terrain from Sg Mati to Tangkak. To the untrained rider, this is the worst part of the journey. Upon arrival in the outskirts of Tangkak, the ride is smooth. The best time to get on your bicycle is at 7am and the journey to Tangkak from Muar takes about 1 hour 20 minutes. What to do in Tangkak? Well, if you love satay, there’s a makan stall located near Public Bank that opens in the evening. This place is pretty decent with Soto Ayam and other Johor-styled Malay dishes. Light traffic: A scene from Muar town on an early Saturday morning. One of the highlights of my visit, was a trip to Kuang Fei beef noodles shop. This is a ‘must-go’ makan place which is highly-rated for their excellent and affordable food. From Tangkak, the Ledang Park is located about 13.5km away. This is the staging point for adventurers as well as nature lovers who wants a dib at scaling Gunung Ledang. You can hangout for the entire day in Tangkak and the return ride to Muar is 73.2km. Since its a long-haul on two wheels, its advisable to pack some spare tire tubes, puncture repair kit and carry plenty of water to stay hydrated. 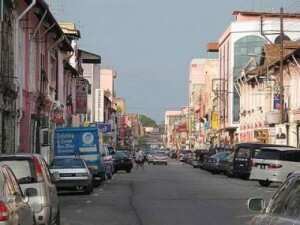 Muar is accessible via the PLUS highway from the Klang Valley and the travel time is about 2 hours 30 minutes. If you plan to ride this route, be prepared for an overnight stay so that you can get ample rest. This entry was posted in Uncategorized on April 18, 2011 by admin. 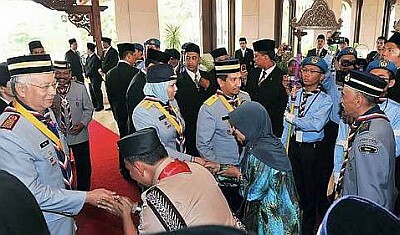 PUTRAJAYA: Raja Permaisuri Agong Tuanku Nur Zahirah and Prime Minister Datuk Seri Najib Razak have been awarded the Bintang Semangat Padi Kelas Pertama (Emas), the highest Scouting award from the Scouts Association of Malaysia. Yang di-Pertuan Agong Tuanku Mizan Zainal Abidin presented the awards at the association’s national-level presentation ceremony at Istana Melawati here yesterday. The Bintang Semangat Padi is bestowed upon outstanding figures and state and national leaders. At the ceremony, the Tuanku Nur Zahirah was also proclaimed National Scouts Honorary Commissioner and the Prime Minister as the Malaysian Scouts President-General. Also present was National Chief Scout of Malaysia Datuk Seri Dr Shafie Salleh. A total of 130 people were presented with scouting awards and medals, namely the Bintang Pahlawan, Bintang Semangat Padi Perak, Bintang Semangat Rimba Emas, Bintang Semangat Rimba Perak, Bintang Semangat Rimba Perak (Honorary), and the Pingat Perkhidmatan Gemilang and Pingat Perkhidmatan Cemerlang. The special award of Bintang Pahlawan, the highest award given to a Scout leader or member for bravery in saving lives and property, went to Sekolah Menengah Kapar Indah Boy Scout, Muhammad Syazwan Zakaria. This entry was posted in Uncategorized on March 16, 2011 by admin. IT WAS a very special Thinking Day for girl guides in Seremban who commemorated the occasion with a visit from Michael Baden-Powell — the grandson of none other than the founding father of the scouts and guides movement — Lord Robert and Lady Olave. Thinking Day is celebrated annually on Feb 22 by girl guides and scouts across the globe as a day to reflect on the meaning of guiding and scouting and also coincides with the birthdays of Lord Robert and Lady Olave. Baden-Powell: Scouting is the greatest peace movement. Baden-Powell and his wife Joan who visited the Negri Sembilan Girl Guides Association (GGANS) building in Seremban recently were given a warm welcome by girl guides who not only demonstrated their skills in turning recycled materials into handicraft but also entertained the couple with performances on stage. The couple were then treated to a sumptuous lunch and more performances by guides and their teachers at the Klana Resort here. Baden-Powell who led guests in singing ‘Happy Birthday’ on stage said he was honoured to be a part of the celebrations and that it was only fitting to mark the occasion with a birthday song. “Scouting had its beginnings more than a century ago and I believe it is the greatest peace movement. “It speaks all languages and cuts across barriers of race, religion and colour. “Both scouting and guiding allows young people the opportunity to find themselves and develop character through emphasising good values like trust, kindness, obedience and courtesy,” he said. Baden-Powell said his grandfather, fondly known as BP, would be proud to see how the movement had grown across the globe from its humble beginnings. The success of the scouting movement prompted BP’s sister Agnes to start its female equivalent — girl scouts and girl guides. “I can just imagine my grand-aunt who was a capable woman getting together a band of young women to form the first girl scouts at a time when women were not encouraged to participate in outdoor activities. They wanted to go camping and canoeing as well and finally got their way. 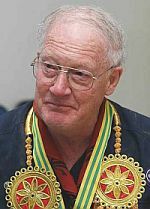 “The scouting and guiding movements have some 40 million members in 218 countries today. Special day: Girl Guides and Brownies in a group photo with the Baden- Powells (wearing garlands) during their visit to Seremban on ‘Thinking Day’ recently. “That is a remarkable feat and it means we must be doing something right to remain relevant after all these years,” he said. Baden-Powell who is himself an active scout, expressed hope that young people in the six countries which did not yet have scouting and guiding would be able to join the movements in the near future. The countries are Andorra, China, Cuba, North Korea, Laos and Myanmar. “The movements bring together people from different countries who share their experiences and culture with each other, especially during our world jamborees. “What we need is world peace. I am sure we can achieve that by practising good values and learning about different cultures,” he said. GGANS president Raja Datin Seri Salbiah Tengku Nujumudin who conveyed her appreciation to the Baden-Powells for taking time off their busy schedule to stop over said that the state association was the most active in the country. “We have the distinction of being the only one in the country to have bagged the prestigious Olave Award for outstanding community service. “It makes us proud that both of you chose to celebrate Thinking Day with us and I am confident that this recognition will spur us on to work even harder,” she said in her speech. Raja Salbiah enlightened guests on the history of the scouting and guiding movements and related a story which resulted in the birth of the scouting movement. “After returning from the Boer War in South Africa, Lord Robert was surprised to find a handbook he had written earlier entitled Aids to Scouting which emphasised resourcefulness, adaptability and leadership qualities that frontier conditions required and which had caught the interest of English boys. “The boys were using it to play the game of scouting which gave him the idea to conduct a 12-day camp with 22 boys in Brownsea Island off England’s southern coast in 1907. The rest, as they say, is history,” she said. Raja Salbiah, who is also the head of the National Council of Women’s Organisations (NCWO) state chapter, said this year’s Thinking Day theme was a cause that she supported and was familiar with. “Women’s issues have always been close to our hearts and this year’s theme — ‘Gender Equality in Empowering Women’ is a fitting tribute to our work in improving the lives of girls and women who should enjoy equality, access to healthcare and education and the ability to fulfil their potential which they can do by picking up leadership and practical skills. “I am glad that this theme was chosen to highlight the plight of young girls and women and help us eradicate inequalities and give our sisters a greater global voice,” she said. 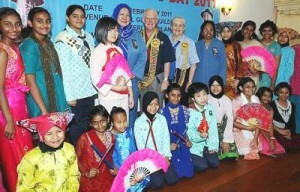 Also present was Malaysian Girl Guides Association chief commissioner Datin Seri Zalilah Mohd Taib. This entry was posted in Events on March 8, 2011 by admin. We have created an official Pengakap.com facebook group. This entry was posted in Announcements on January 29, 2011 by admin.